There’s something about Australia in the summer. The skies are such a clear blue, the sun so sharp, with no pollution to get in the way, the grass in the parks green, dogs chasing balls that their owners have flung and an overall sense of the outdoors and well being. When you get off the plane from a multiple-leg international flight, as a cricket reporter, you look for what you think are basic necessities: a local SIM card to get the mobile phone up and running, an adaptor plug that will allow Indian devices to work with Australian plug points and perhaps a nicotine top-up after a long time cooped up in an economy flight. Then you look around you and every second person, bleached blonde, fitter than some of the cricketers on this tour, is carrying a surfboard. “When you visit one of our lovely beaches please be sure to swim between the appropriate flags so our life-savers can keep an eye on you when you’re out there,” came the announcement just as you got off your flight. For some of us, to whom surfing means looking for something to watch on Netflix, this is a departure and a reminder that you are in one of the most outdoorsy countries in the world. Australia’s media has often been described as the 12th man to the team because of the manner in which they make life difficult for any touring team. From barbs, to sledges to outright innuendo, the tabloids can have a crack even before the first ball is bowled, but The Advertiser, a South Australia newspaper, had a pleasant departure from this tradition, even if not in their sports pages. 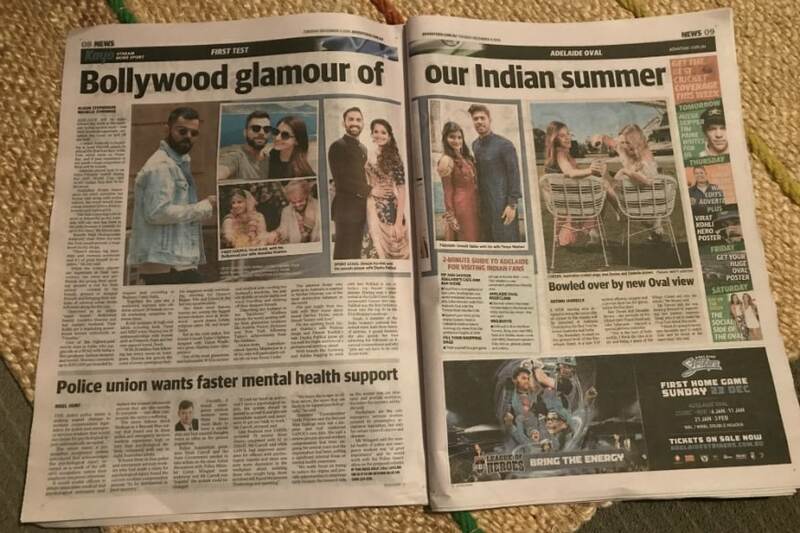 “Bollywood Glamour of our Indian Summer,” ran the headline spread across two pages, and they were not talking about the Men in Blue. Rather, this piece focussed on the Wives and Girlfriends — rather unfortunately referred to as WAGs in sporting parlance — who will be accompanying their men Down Under. At the Adelaide Oval on Tuesday, the Australian net session had two most interesting visitors. Steve Waugh, the former Australian captain, the man behind mental disintegration and much else, the tough as nails sledger provided the cricket input, helping with coaching staff and keeping a keen eye on the players even as batsmen were peppered by short-pitched bowling on practice pitches in the nets that were far more lively than what you expect to get out in the middle in Adelaide. But the chief draw was six-year-old Archie Schiller, a child who has spent a lot of his time dealing with an irregular heartbeat that has required constant medical attention. A cricket fan and a tiny tot who bowled two wicketless overs (he was a bit embarrassed about conceding a wide) in a recent match, Schiller was honourably inducted into the Australian mix on Tuesday. Schiller bowls legbreaks, but celebrates like his idol, offspinner Nathan Lyon, and likes to accompany his cover-drives with energetic commentary. With two surgeries, including one that lasted seven hours, already endured, Schiller is better now and thanks to the Make A Wish Foundation, will be part of Australia’s Boxing Day Test match celebrations in Melbourne later this month. To be fair, it was the experience that was amazing for this little boy, who will remember the big day for years to come.